Although you might prefer to listen to music or audio of any kind using headphones, there’s a certain element of fun in using speakers. Apart from the social aspect of it, there’s also a fair bit of convenience to having the sound play out loud rather than in just your ears. While wireless speakers used to be expensive, new brands and manufacturers have made pricing competitive and affordable. One such affordable option is the new Boat Stone SpinX, which is priced at Rs. 2,699. On the face of it, the Boat Stone SpinX comes across as rather ordinary, sporting a design previously made popular by a major manufacturer. However, the speaker has a rather interesting feature — wireless daisy chaining, which the company calls True Wireless. We’ve tried out the Boat Stone SpinX and all of its features, and here is our review. As previously mentioned, the Boat Stone SpinX features a design that’s rather familiar, having been made popular by the JBL Flip series. The cylindrical shape of the speaker has numerous benefits, including ease of placement and storage, and the ability to broadcast sound in all directions. The Boat Stone SpinX features rubber-finish plastic on the edges and a fabric cover around the body of the speaker. You also get four buttons that control the power, volume, and playback. 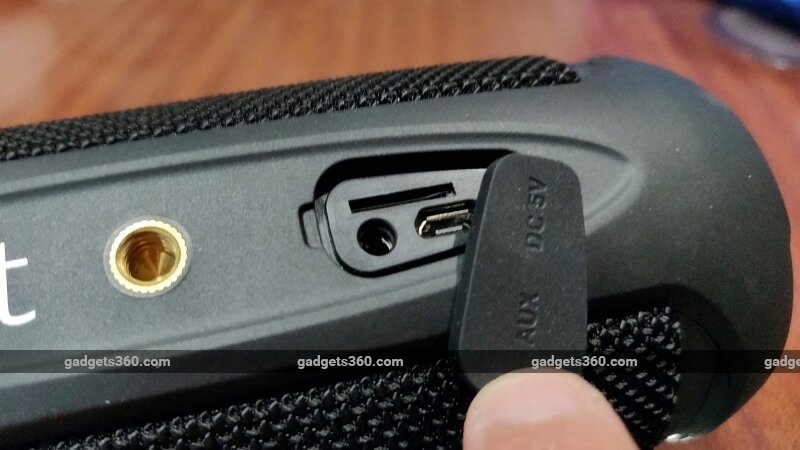 A Micro-USB port for charging and an auxiliary input (aux-in) socket are located on the base. The device features two 6W drivers along with two bass radiators that flex a fair bit depending on the level of bass in the audio you play. It has a frequency response range of 160-20,000Hz. For connectivity, you get to choose between Bluetooth 4.2 and the wired auxiliary input. The speaker also features IPX6 dust and water resistance, which means that it’s expected to survive accidental spills or brief exposure to rainfall. You can use the speaker placed either vertically or horizontally, although vertical placement will block one of the bass radiators and affect the sound slightly. It’s available in three colour options online — black, blue, and grey. The Boat Stone SpinX has a 2,000mAh battery powering it, with a claimed battery life of eight hours on a full charge. We were able to get a little under seven hours with mixed usage on a single charge, which is average for a speaker in this price range and with this set of specifications. Using the ‘True Wireless’ functionality (we’ll get to that in the next section) does drain the battery slightly quicker, but the difference isn’t significant. With its price tag of Rs. 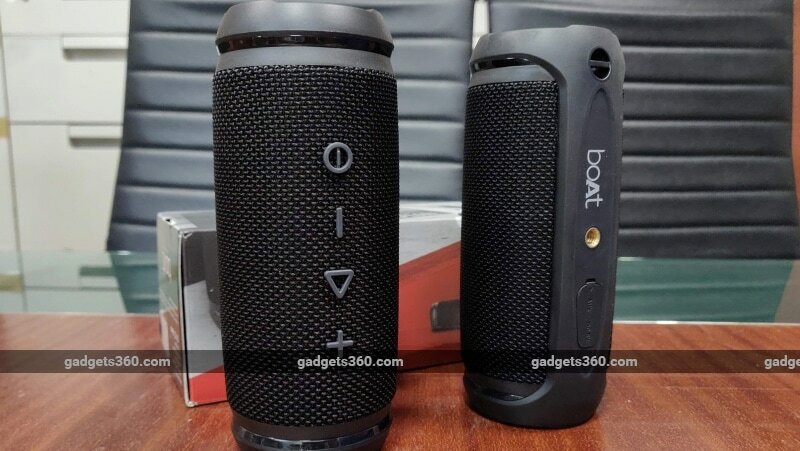 2,699, the Boat Stone SpinX promises better value compared to brands such as JBL and Sony. 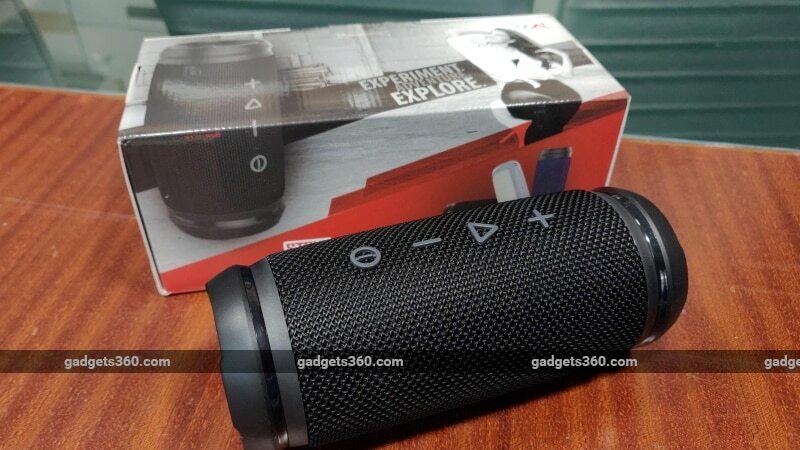 On paper, it’s similar to the JBL Flip 4, which is currently priced significantly higher at Rs 7,000, so there is definitely good reason to consider this device for its price. However, when it comes to performance, there is a marked difference between the Boat Stone SpinX and JBL Flip 4. It just doesn’t deliver the same quality of sound as higher-priced options. While you do get strong sub-bass levels and punchy sound in general, you’ll only really be entertained when you listen to specific genres such as house music . The low-end does tend to occasionally distort with this speaker, but that can be corrected by keeping the volume anywhere below the 80 percent mark. Listening to Keep It Close by Seven Lions, the Boat Stone SpinX demonstrated good highs without sacrificing too much in the low-end. However, the vocals in the track were somewhat lost to the bass and highs, and we were left feeling like we didn’t hear the song as we were meant to. The weak mid-range tended to show in all tracks with vocals, and to an extent even when we used it while watching movies and TV shows on a smartphone. With Netsky’s The Whistle Song, the typical bass you would expect in a drum-and-bass track such as this was enjoyable to listen to, and the few vocals didn’t tend to matter much, even if that lack of quality in the mid-range was audible once again. However, we switched to using the True Wireless mode at this point, and that seemed to make all the difference. While Boat markets this feature as ‘True Wireless’, it isn’t quite the same as what we’ve grown to expect from this term. In the case of the Stone SpinX, it’s essentially a method of daisy-chaining two speakers together without using wires, assuming that you have two Boat Stone SpinX units. The instructions to connect the two speakers wirelessly are included in the box. The process itself takes just a couple of minutes and is easy enough to execute. The idea of daisy chaining has been around for a while, but it’s particularly relevant here because the low price of this speaker makes it reasonable to actually buy two units. At Rs. 2,699 apiece, you’d only have to spend a little over Rs 5,000 for a pair, which is still significantly less than the price of a single JBL Flip 4. If you’re considering the Boat Stone SpinX, we’d actually recommend that you buy two, because this vastly enhances the sound quality. With two speakers connected, the sound is louder, cleaner, and surprisingly better-sounding. Boat does state that you get true stereo separation in this mode, but in our experience, the effect wasn’t quite as prominent as with proper two-channel speakers. While listening to a high-resolution version of Pink Floyd’s Money did demonstrate stereo separation, we could not hear a difference in the sound between the two speakers in most other tracks that we streamed, including Queen’s Bohemian Rhapsody and The Who’s Baba O’Riley. However, we did perceive an improvement in audio quality, due to the improvement in imaging as a result of using two speakers placed a short distance apart. With a distance of about 1m between the two speakers, the imaging was nearly as good as we would expect from a regular wired stereo setup. Listening to Grandtheft’s All The Way Up, the entire frequency range saw an improvement thanks to the addition of the extra speaker. There are fortunately no latency issues either, and the sound is properly coordinated between the two speakers, thereby ensuring a stronger, louder and more appealing sound. The sub-bass saw a significant improvement, as did the highs. While the mid-range also saw a small improvement, this wasn’t quite enough. On the whole, it’s fair to say that audio performance with a single Boat Stone SpinX speaker is average, as you would expect for the price. However, adding a second speaker to the equation makes a bigger impact than just a doubling effect. If you think of it as a two-speaker setup for Rs 5,400, the Boat Stone SpinX is an excellent product (or two) for your home and outdoor listening needs. As a single speaker, the Boat Stone SpinX is average at best. There is a definite issue with the mid-range, and the sonic signature is ordinary on the whole. However, it is well priced, and would be worth considering purely for its affordability because of what you get for that price. Yet, we’d recommend that you consider the idea of getting two of these, and also suggest that buyers with a higher budget consider buying two Stone SpinX speakers instead of one from another brand. The enhancement in performance is noticeable and significant, and the ease of pairing two speakers makes the process hassle-free. It’s definitely worth considering for this alone, and shows that Boat has what it takes to give brands such as JBL and Sony strong competition.